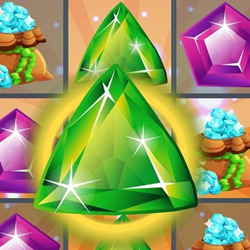 One special app, Jewel Clash Mania is giving users the chance to win gift cards and rewards to the top jewelry brands in the world. Starting with a Valentine’s Day Facebook Contest. With Valentine's Day just around the corner one special app is giving users the chance to win gift cards and rewards to the top jewelry brands in the world. Jewel Clash Mania is starting with a Valentine’s Day Facebook Contest. It’s very simple, anyone can download the mobile app and use a simple screenshot of their high score posted to the Jewel Clash Mania Facebook page for a chance to win rewards to some of the finest jewelry brands in the world. Levels 25, 50, and 100 are all a part of the Contest. The first series of rewards will be gift cards to the luxury jewelry brand Kay Jewelers. Kay Jewelers is a part of Signet Jewelers Limited, one of the largest specialty jewelry retailers in the US, UK and Canada. Operating approximately 3,600 stores primarily under the name brands of Kay Jewelers, Zales, Jared The Galleria Of Jewelry, H.Samuel, Ernest Jones, Peoples, and Piercing Pagoda. The company's annual sales derive from the retailing of jewelry, watches, and more. Jewel Clash Mania, is one of 2018’s must have apps. Whether it's Valentine’s Day, Mother's Day, or Father's Day, Jewel Clash Mania plans to give users the opportunity to win gift cards and rewards to top the jewelry companies in the world. “We’ve been very fortunate to envision a global campaign of this magnitude. We love to build apps and know how lucky we are to be working with the largest technology companies worldwide as a developer. We’re in the golden age of technology and we look forward to giving everyone a chance to win amazing rewards and gift cards all year,” said Watson James CEO, Golden Age Digital. As Apple, the world’s most valuable company, said that it will spend $350 billion on development and create 20,000 jobs in the United States in the next five years, apps like Jewel Clash Mania can revolutionize the app store. Apple said a new set of investments to build on its commitment to support the American economy and its workforce, concentrated in three areas where Apple has had the greatest impact on job creation: direct employment by Apple, spending and investment with Apple’s domestic suppliers and manufacturers, and fueling the fast-growing app economy which Apple created with iPhone and the App Store. Apple is already responsible for creating and supporting over 2 million jobs across the United States and expects to generate even more jobs as a result of the initiatives that have been announced. According to numerous sources Apple will be combining new investments to the current pace of spending with domestic suppliers and manufacturers resulting in an estimated $55 billion for 2018. To the US economy, Apple’s direct contribution will be more than $350 billion over the next five years in part from opening data centers to feed growing demand for services like iCloud. Reports have announced Apple also says it will back the next generation of students by expanding its current efforts to support coding and STEAM (Science, Technology, Engineering, Arts and Math) programs, all while adding new programs to help teachers. While emerging markets have powered market growth, established markets have led to the most revenue growth. The U.S. and South Korea have had the most growth in market share of worldwide consumer spend, but the U.S. and Japan saw the largest absolute growth year-over-year. "The App Stores continued growth gave us the right perspective, and we knew we could do something special for not only our users, but the world in an all new way,” said James. Several European markets also impacted consumer spend across both iOS and Android. Including the U.K., Germany and France, which each ranked in the top 10 for consumer spend on both app stores. A chance for everyone worldwide to win rewards to the top jewelry brands will be a game changer. Jewel Clash Mania is the app to look out for in 2018. Signet believes customers associate their brands with high quality jewelry and an outstanding customer experience. Expressing romance and appreciation through jewelry and gift giving is very important to their customers.